I am quoting above from Tricky's preschool newsletter which I will of course use in scrapbookish fashion or at very least keep shoved in memorial shoebox because it is our VERY FIRST PRESCHOOL NEWSLETTER EVER. In years to come we will look back with warm hearts and moistened eyes to see that one of the teachers is having a holiday! Lucky her! And, soon it will be Father and Grandfather's morning! Welcome all old blokes related to students! And, A Very Special Thankyou to the Mother who donated two CDs! No one likes a smug miss. But, it is the can come dressed as fave book character that has me tapping my fingers in an anxious fashion. This of course is merely the latest in a whole series of Preschool related anxiety-tapping moments. He has attended less than ten times and already I have worried about him 'having no friends', 'playing all alone', 'wearing distinctively weird trousers' and 'Suzie ate my cheese.' This last came directly from Young Master when I asked if he enjoyed his snack box. Despite the fact that there appears to be no Suzie in his class I still feel slightly anxious because what if he's being bullied by an imaginary friend? We all know what happens to kids that are different, I told my husband. 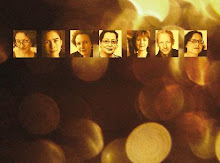 They grow up to be leaders and artists and imaginative thinkers, he responded. Perhaps, I nodded, and perhaps the other kids peck their eyes out. Re Book Week and dressing as fave character, it seems obvious to me that firstly there is no "can" there is only "will". Tricky must go dressed as something bookish because otherwise he will be different and, as we know, different is dangerous. Problem is, Tricky's fave books just now are The Gruffalo (orange eyes, black tongue, poisonous wart on end of his nose), The Waterhole (various non-extinct and extinct animals), The Very Hungry Caterpillar(two choices, caterpillar or butterfly) and various Charlie and Lola adventures. I have a scant couple of weeks to solve this and while I am confident in the papier mache sphere I do not have stitching abilities. Butterfly wings for instance are probably right out. If worst comes to worst, I told C, I could just write Charlie on a tee-shirt and he could go as "Charlie". C was unimpressed. "He likes Where The Wild Things Are," he said "why doesn't he go as Max? All he needs to do is wear that hoodie." "Max wears a full body suit with hood and ears", I said. "We don't have anything that looks even vaguely like that." "Yes we do", C insisted. "It's grey and sleeveless. There's a picture of a bear on the front." 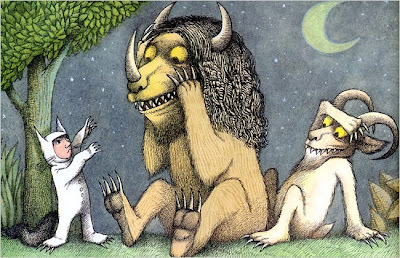 "And...that looks nothing like Max in Where The Wild Things Are." "He could have gone really wild," C insisted, "and cut off his sleeves." I gave him the patented Mother Knows Best frown. "And screenprinted a design on the front?" C turned back to his computer, slightly offended. "Well," he said, "that's who I always think of when he wears that shirt." Father proving himself no help at all, I am left pondering butterfly wings and Charlie tee-shirts. Oh and poisonous warts. I'm pretty sure I could papier mache one of those up, no trouble. Oi, definitely no "can" there... only pressure!! Jeez! How much free time do these people think parents have?!?! You cant win with these events. I thought I had managed a decent Angelina Ballerina outfit but had not figured with the mum who used to be stage designer's version of same. Daughter thoroughly unimpressed with my effort.